Curtis Thompson headed into his own net and Gavin Tomlin's close-range effort gave Port Vale an early 2-0 lead. A second-half volley from Campbell-Ryce gave Notts the lead before he met Jack Grealish's pass to add a fourth. The victory leaves the home side level with Carlisle, who have a game in hand, and Crewe on 43 points and precariously placed with four games left to play. Match ends, Notts County 4, Port Vale 2. Second Half ends, Notts County 4, Port Vale 2. Attempt missed. Nathan Tyson (Notts County) left footed shot from the centre of the box is too high. Corner, Port Vale. Conceded by Gareth Roberts. Attempt blocked. Billy Knott (Port Vale) right footed shot from outside the box is blocked. Corner, Port Vale. Conceded by Hayden Mullins. Corner, Port Vale. Conceded by Bartosz Bialkowski. Goal! 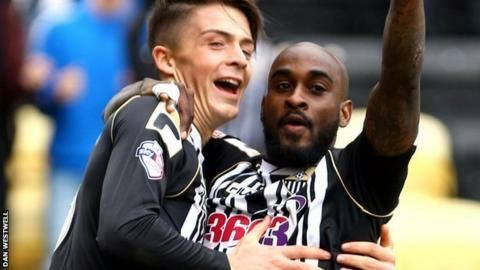 Notts County 4, Port Vale 2. Jamal Campbell-Ryce (Notts County) right footed shot from the right side of the box to the bottom left corner. Assisted by Jack Grealish. Substitution, Notts County. Nathan Tyson replaces Ronan Murray. Attempt saved. Gavin Tomlin (Port Vale) right footed shot from outside the box is saved in the bottom left corner. Attempt missed. Jennison Myrie-Williams (Port Vale) right footed shot from a difficult angle on the left is just a bit too high. Attempt saved. Tom Pope (Port Vale) header from the right side of the box is saved in the bottom left corner. Jennison Myrie-Williams (Port Vale) wins a free kick in the defensive half. Attempt blocked. Jamal Campbell-Ryce (Notts County) right footed shot from outside the box is blocked. Attempt saved. Louis Dodds (Port Vale) right footed shot from outside the box is saved in the top centre of the goal. Jack Grealish (Notts County) wins a free kick on the right wing. Foul by Billy Knott (Port Vale). Substitution, Port Vale. Louis Dodds replaces Chris Birchall. Attempt missed. Ronan Murray (Notts County) right footed shot from the centre of the box is close, but misses to the left. Corner, Notts County. Conceded by Chris Robertson. Foul by Jennison Myrie-Williams (Port Vale). Attempt saved. Ben Williamson (Port Vale) right footed shot from very close range is saved in the bottom right corner. Substitution, Port Vale. Ben Williamson replaces Anthony Griffith. Foul by Curtis Thompson (Notts County). Attempt saved. Gavin Tomlin (Port Vale) left footed shot from outside the box is saved in the centre of the goal. Attempt saved. Billy Knott (Port Vale) right footed shot from outside the box is saved in the top centre of the goal. Attempt missed. Ronan Murray (Notts County) right footed shot from the centre of the box misses to the right.